How much cost a Gondola Ride at The Venetian Las Vegas? Do you think it is expensive, right? So, check this blog post to see what you are missing in Vegas. 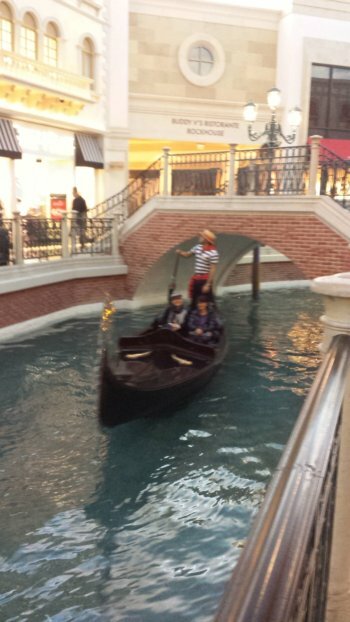 While in a business trip in Las Vegas, the last thing I was imagining is a gondola ride in the hotel The Venetian. I was there for work, so, my spare time was usually on pubs, casino, restaurants and I thought this romantic attraction was only for couples. That was when my two workmates invited me for a gondola ride in Las Vegas. Christine and Jenny, both living in Vegas convinced me to do it. So, let's go! On Saturday, after leave my room at The Venetian Las Vegas, my friends said they booked a ride for the morning. The cost was around $165 for 3 people and also includes access to Madame Tussauds Museum with 4D Cinema and souvenir guidebook. The duration of the ride is 1 hour, and with these extras features, I found it interesting. I am in, to do one of the best things to do in Las Vegas. Something really unexpected. 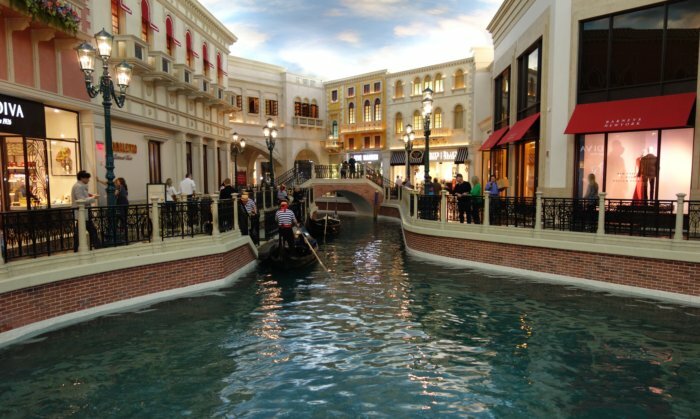 How much does a Gondola ride at The Venetian Las Vegas cost? Hotel Official Price: $116 (private gondola for 2). We paid $165 for 3 including Madame Tussauds Museum with 4D Cinema. Reading the hotel's website, you will see different packages and also including photography. The packages available are the regular pricing are with the Shared Gondola (Seats Four) which costs $29.00 per person or in a Private Gondola (For Two) for $116.00. You can also request photo services starting at $22. The premium pricing of a Shared Gondola (Seats Four) is $39.00 per person and Private Gondola (For Two) is $156.00. Please note that the "Premium Dates" are 1/26-27, 2/14-18, 3/23-31, 4/13-21, 5/24-27, 7/4-7, 8/30-31, 9/1-2, 11/28-30, 12/1, 12/21-31. Check the site for more details. After the ride, I checked other sites and see a lot of them charging way more than the girls paid. Also, you must keep attention on the premium dates which is the high season and will cost you more. The great advantage of booking online is that you will have the price guaranteed and the gondoliers won't charge you any extra cost. If you book at the hotel, you'd probably have to pay some extra costs especially if you request the gondolier to sing a song. You can find a lot of sites to book gondolas ride in Las Vegas, but checking the prices of other sites I see a huge difference. Some of them are selling for $100 per person and not including the entrance to Madame Tussauds museum. As you can see, the prices will range a lot and very interest that in the hotel's website the price was higher than the site the girls booked. Anyway, I found that even online booking sites can overprice the ride and if you do not search the internet, you will pay way more. So I started to find some other travel sites with more interesting prices and with a package including the gondolier playing accordion or singing a song with a very fair price. 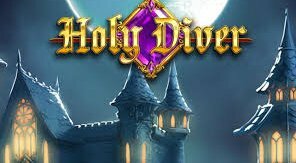 I was wondering this was the website the girls booked our gondola ride at The Venetian Hotel. 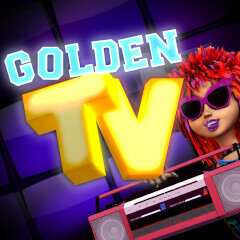 The site offers 2 different packages so certainly you will pick the right one for you. 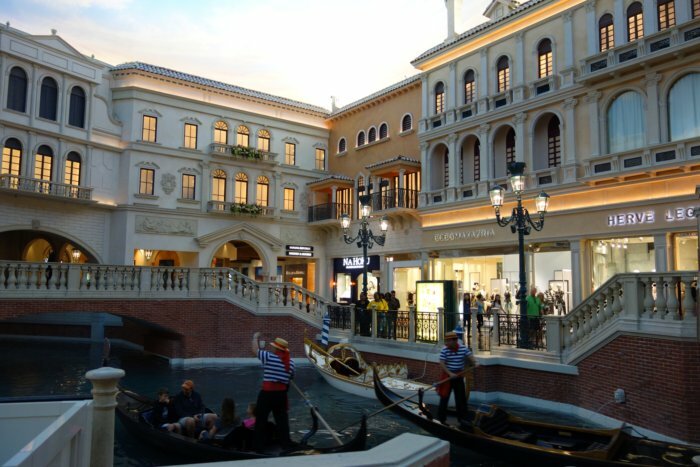 The time of the ride is 1 hour and the distance you will ride in the gondola is through the Grand Canal at The Venetian, overlooking the shops and hotel's exterior decoration. Such a great tour. So, I confirmed with the girls and they really booked the Gondola Ride in Viator site. 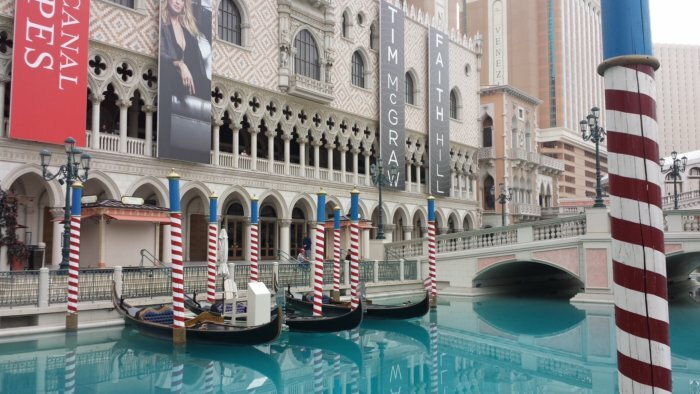 They also told me that was trying to buy the tour directly with gondoliers and other sell points in the Strip Blvd but the prices were very high if compared with the online deals. So, $165 for 3 people in a Gondola with the gondolier singing Italian songs and also including Madame Tussauds Museum with 4D Cinema was a great deal for this tour. The gondola was very comfortable and well decorated. Really well maintained. This also shows you can get discounted prices for the tour if you search over the internet and not only looking in land-based shops. 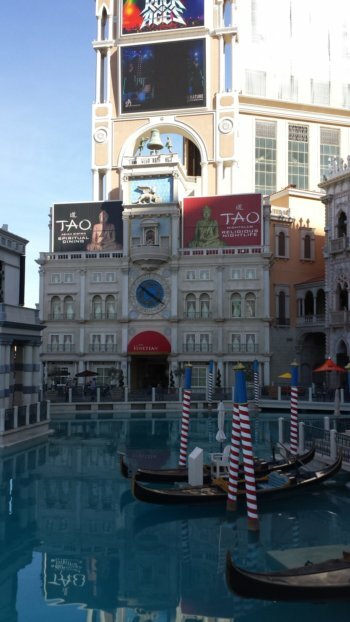 This package offer for $165 for 3 people and with extra entrances was a great price, as The Venetian never have a low season. The gondoliers are very gentle and they know a lot of information to make your tour a bit cultural. It was a great experience to see the beauty of the hotel The Venetian from the water. It's weird as while you are walking through The Venetian Hotel you face huge crowds, noisy and sometimes stresses because of the number of people walking in all directions. Gliding down the Grand Canal at The Venetian was very calm and relaxing. I can recommend this tour to enjoy an hour of tranquility and relax a little bit. By the end, it was a therapy for my day. Our gondola was riding very smoothly and the quite moments relaxed all of us. The gondolier explained everything from the hotel's architecture and also gave us important information about the spots in Italy that was reproduced within The Venetian Resort in Las Vegas. I think it was a really great choice and I started to do this tour regularly. Really worth the price as the results of this tour will make your day much better. It is also interesting seeing other gondolas gliding slowly as you move down the Grand Canal of The Venetian Hotel. I believe the sound of the water also helps you to relax. Well, I close this blog post writing that I recommend you this tour.